Fianna Fail’s poor election performance has lead some commentators to speculate that the party may be out of power for a considerable period of time, but a study of individual constituency results suggests that significant seat gains may be made by the party at the next general election on a swing to the party of just a few percentage points. Indeed a swing of 2%, or less, to Fianna Fail could lead to the party regaining seats in most constituencies in the Dublin and East region. Looking at the (vote) margins by which Fianna Fail fell short by in the thirty-nine different constituencies invovled (excluding Cork North Central, Cork South Central, Donegal North East and Limerick, where all the selected Fianna Fail candidates were all elected) , the swings (relative to the candidate/party who won the final seat) that the party would have required to win these seats can be seen to vary sigificantly (as the map above shows). The level of these swings range from as little as 649 votes or 0.57% (from Sinn Fein to Fianna Fail in Cork East) to as much as 9,483 votes or 11.16% (from the Socialist Party to Fianna Fail in Dublin West). Had the party been VERY lucky on election day and attained precisely the exact amount of extra votes needed to win these seats by the narrowest of margins, it would just have required Fianna Fail to have won a combined swing of 117,860 votes from the different parties concerned in the different constituencies, which would have left the final seat tally looking as such: Fine Gael 61, Fianna Fail 59, Labour 27, Sinn Fein 9, United Left Alliance 1, Others 9. This unlikely scenario of course would have required a perfect storm of Fianna Fail good luck, leaving them winning the final seat in all of the 39 constituencies by just one vote! A more realistic scenario might be to consider the case of the constituencies where a small swing of 2%, or less, from the party/candidate winning the final seat to Fianna Fail would see Fianna Fail gaining that seat instead. 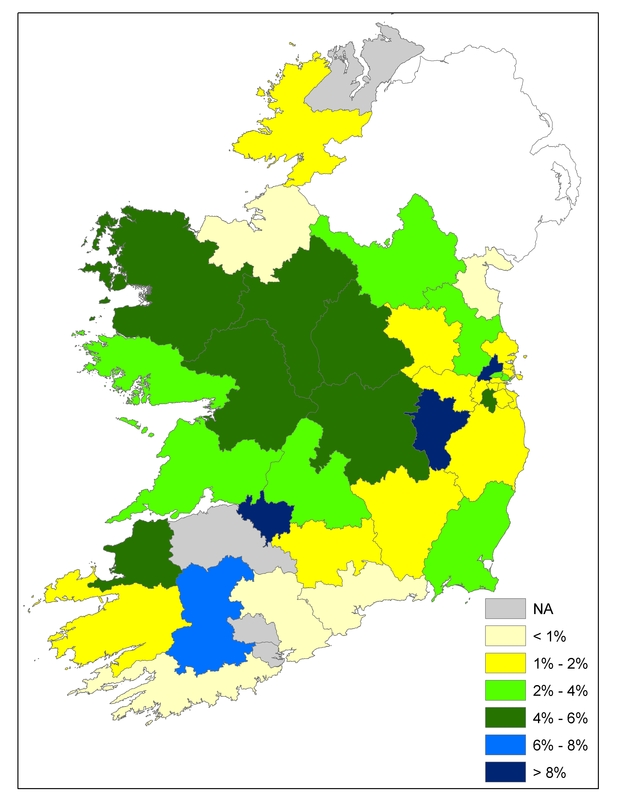 In all, twenty one constituencies (as highlighted by the yellow shadings on the map above) fall into this category, with a number of these being located in the Dublin (eight constituencies), rest of Leinster and Cork regions. Looking at the parties who would lose out as a result of such gains, we can deduce that Fianna Fail winning these seats would produce a revised seat tally as follows: Fine Gael 68, Fianna Fail 41, Labour 34, Sinn Fein 11, United Left Alliance 2, Others 10. Ultimately, the main message from these figures is that even a small percentage swing back to Fianna Fail at the next election could see the party regaining a number of the seats lost by them at the 2011 General Election, with the extent of such gains being increased if the party gets “lucky” (i.e. gains support in the constituencies where they need such increased support to win seats) or if the party becomes more transfer-friendly at this election. The significant redrawal of Dail constituency boundaries, in light of proposals to reduce the number of Dail seats by up to 20, in turn may also work to the party’s advantage if these changes work more against opposing parties than Fianna Fail. One final point to note is that Fianna Fail losses could have even been more severe in General Election 2011 if the swing against them in certain constituencies had proven to be slightly more severe (or indeed had Fine Gael and Labour’s vote management strategy been tighter (as in Dublin West) or candidate selection strategy been more ambitious (as in Kildare South). The especially vulnerable Fianna Fail seats be gleaned by viewing the earlier post reviewing constituency marginality in the recent general election. Thus, while the party has significant scope for regaining seats based on small percentage swings especially in certain parts of the states, the party could stand to lose even further seats if the pendulum swings slightly against the party in their more vulnerable constituencies. Seats that might be vulnerable include the aforementioned Kildare South and Dublin West, as well as Limerick, Donegal North East, Cork North Central, Longford-Westmeath, Clare and the second seats in Laois-Offaly and Cork South-Central. This entry was posted in Constituency information, Election data, Electoral Geography (voting maps), Marginality and tagged Fianna Fail, Marginality. Bookmark the permalink.